I have a whole lot of beliefs rummaging around my mind. I believe, for example, that I am here at this moment writing this blog while listening to some funk artist called Kyle Hollingsworth on Spotify. I believe I grew up in England and was married in Minnesota in 2003 on a day when it was twenty below. I might be mistaken about what I believe, but I am not mistaken that I believe those things. Beliefs don't float around in the air ready to be caught. Rather, I have beliefs. If there were no people, no minds, there would be no beliefs. Other things, like propositions, are not dependent upon my mind being there. I might never have been born and so my belief that the earth orbits the sun would not have existed. But the proposition--that the earth orbits the sun--would still be there. At least, it would still be true that the earth orbits the sun (if the earth does orbit the sun and some people aren't so sure). One of my beliefs is in the following proposition: I don't have a choice over what beliefs I have. I may have a choice about my actions and those actions might lead to obtaining some beliefs and not others but I don't come to believe what I believe by choosing what to believe. I don't have much say in my belief that I am writing my blog listening to funk nor that I grew up in Britain and was married in Minnesota. 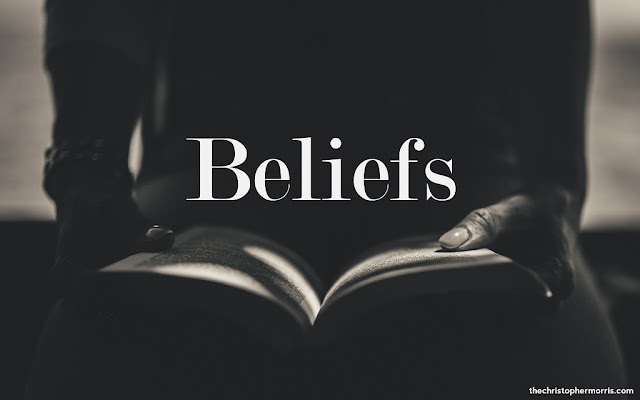 Beliefs are also the kind of thing that generate a range of confidence. Some of my beliefs I am pretty sure about. For example, I have a belief that I am sitting. Could I be standing? Sure, it is possible, but no matter how hard I try I can't shake the contrary belief that I am sitting. Other beliefs I am less sure about. Was it twenty or thirty or even forty below zero on our wedding day? I am sure it was below freezing and just as sure that it was below zero. I can choose to do things that might strengthen a belief such as reminding myself that there was snow on my wedding day and that the date was 8th February and that we were in northern Minnesota. All these recollections will assure me that it was very cold on my wedding day. But none of these will amount to choosing what to believe. Even if I recall my wedding day and to my surprise recall the dripping of an icicle and am inclined to think there was a temporary thaw that day, I am not choosing to believe anything. I am merely changing a belief due to some additional piece of information. The point of all this is that, contrary to popular opinion, we don't get much choice over most of our beliefs.